Vishwanath, S. J., Domergue, F. and Rowland, O. (2014). Seed Coat Permeability Test: Tetrazolium Penetration Assay. Bio-protocol 4(13): e1173. DOI: 10.21769/BioProtoc.1173. Vishwanath, S. J., Kosma, D. K., Pulsifer, I. P., Scandola, S., Pascal, S., Joubes, J., Dittrich-Domergue, F., Lessire, R., Rowland, O. and Domergue, F. (2013). Suberin-associated fatty alcohols in Arabidopsis: distributions in roots and contributions to seed coat barrier properties. Plant Physiol 163(3): 1118-1132. Seed coat permeability is important to study as it plays significant roles in seed dormancy, germination, and protection from pathogens. Here we describe a commonly used seed coat permeability test known as the tetrazolium penetration assay with a method to quantify the levels of permeability. Tetrazolium red is a cationic dye that is widely used in seed viability testing. Tetrazolium salts are amphipathic cations, which, after penetrating the dead cells of the seed coat, are reduced to red-colored insoluble precipitates made up of formazans by active dehydrogenases (NADH-dependent reductases) in the embryo of seeds (Berridge et al., 1996). The intensity of red coloration is directly proportional to the permeability of the seeds. The quantification involves extraction of formazans from the incubated seeds and spectrophotometric determination of absorbance of formazan extracts at 485 nm. Note: This protocol is optimized for testing Arabidopsis thaliana seeds. Prepare 1% (w/v) aqueous solution of tetrazolium red and store in a brown bottle. Set the incubator temperature at 30 °C. Weigh 50 ± 1 mg of dried seeds for each sample and place them in a 1.5 ml microcentrifuge tube. There should be at least three replicates for each sample. To measure the permeability over a time course, choose at least 5 time points (such as 4 h, 24 h, 48 h, 72 h, 96 h) and distribute the seed samples (with replicates) accordingly. Add 1 ml of 1% tetrazolium red solution to each tube containing seeds. Place these tubes in a microfuge tube rack and cover them with aluminium foil (incubation must be done in darkness). Place them in the air incubator at 30 °C for the specific time periods chosen. 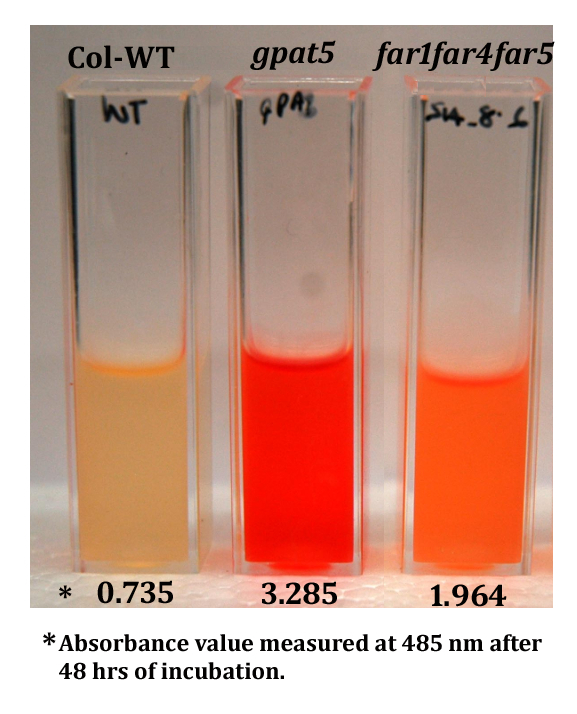 A negative control using water instead of tetrazolium red should be performed when doing the assay for the first time. After completion of incubation for each time period, remove the tubes with seeds for observation. Observe the seeds change in color (look for formation of red color) and image some seeds using a stereomicroscope (Figure 1). The seeds can be kept at room temperature for microscope imaging but they should be imaged within 1 h. If longer, keep seeds at 4 °C. For the extraction of formazans, transfer the tube contents (seeds and the 1% tetrazolium red solution) into a mortar using a 1 ml pipette. Use cut tips to avoid clogging tip with seeds. The extractions should be performed immediately after each time point (do not store time points and do all at once). Remove the 1% tetrazolium red solution from the mortar using a glass pasteur pipette and discard. Wash the seeds with distilled water twice by rinsing using the pasteur pipette. Remove the water from the mortar and discard. Add 1 ml of 95% ethanol to the seeds in the mortar and finely grind the seeds using a pestle. Transfer the whole ground seed material in ethanol solution to a fresh microfuge tube using the pasteur pipette and adjust the final volume to 1.5 ml with 95% ethanol. Immediately centrifuge the tubes at 15,000 x g for 3 min. Collect the supernatant into a spectrophotometer cuvette (Figure 2). Note: Steps 7 and 8 must be performed quickly to avoid reaction of tetrazolium salts with the embryo cells after seed disruption. Using a spectrophotometer, measure the absorbance of the formazan extracts at 485 nm (Figure 2) and plot the readings. Use 95% ethanol as the reference (blank). Figure 1. Example of staining patterns prior to extraction of formazans. Staining pattern in seeds of Col-WT and seed coat permeability mutants incubated in 1% tetrazolium red at 30 °C and imaged using a stereomicroscope at the end of 48 h. The gpat5 mutant is severely affected and far1 far4 far5 triple mutant is moderately affected (Vishwanath et al., 2013). Figure 2. Example of formazan extracts collected in spectrophotometer cuvettes and ready for absorbance measurements. The extracts are from 48 h time point. The data below each cuvette is the mean value of three replicates. The gpat5 mutant is severely affected and far1 far4 far5 triple mutant is moderately affected (Vishwanath et al., 2013). It is important to use seed that is relatively freshly harvested (less than 6 months old). If comparing genotypes, the plants should be grown together and the seeds harvested at the same time. For each sample, seeds should be uniformly well ground. Avoid collecting any seed debris while transferring the supernatant into the spectrophotometer cuvette. Use fresh cuvettes for each sample reading. The absorbance values of all the samples should be measured as quickly as possible. There should not be a big time gap between reading samples. Dilutions of samples in 95% ethanol should be made for absorbance values higher than 0.8 to remain in the linear range of the spectrophotometer. Then calculate the absorbance in the original samples using the dilution factor. This protocol was adapted from Molina et al. (2008). This work was supported by a Discovery grant to O.R. from the Natural Sciences and Engineering Research Council of Canada. Berridge, M. V., Tan, A. S., McCoy, K. D. and Wang, R. (1996). The biochemical and cellular basis of cell proliferation assays that use tetrazolium salts. Biochemica 4(1): 15-19. Molina, I., Ohlrogge, J. B. and Pollard, M. (2008). Deposition and localization of lipid polyester in developing seeds of Brassica napus and Arabidopsis thaliana. Plant J 53(3): 437-449. I guess you mean Nathopodytes foetida. The seed dormancy in Nathopodytes is due to excess amounts of phenolics in seeds. Also, the treatment differs between variety and population of the seeds. You can try scarification of seed coat and GA3 treatment. Hope this helps.